There is plenty of writing out there describing what minimalism is and what it means. The two leading minimalists in the internet world are Joshua Fields Millburn & Ryan Nicodemus. These guys write on their blog www.theminimalists.com (you may have seen their Netflix documentary. If not, I would highly recommend it). For me, minimalism is about asking a simple question. Does this add value to my life? This simple question can be applied to not only physical possessions but to the activities you do and the people you spend time with. It is a powerful mantra for self-reflection. For the last 10 years, I have definitely not lived a minimalist lifestyle. The cars I’ve had on finance, the latest mobile phones and other, often pointless gadgets proved this. But it only recently dawned on me that none of these ‘shiny’ new possessions brought me happiness. Not real happiness. Sure, I was happy when I first drove the car from the showroom with only 8 miles on the clock but after a few months that happiness fades and the car just becomes normal. It was adding no more value than a car purchased for a fraction of the price would have brought. What I was left with was an ongoing finance payment that could have been put to much better use. The best decision I have made this year was to sell the car and clear the finance. Feeling the need to keep up appearances with colleagues, friends and even the 5000 or more advertisements that are rammed down our throats each day only leads to a feeling of emptiness. The adventure travel market is no different. Many of the big name adventurers make a lot of money through selling products. From watches, cars, knives, the latest seasons clothing, torches, cameras – the list goes on. I don’t blame the adventurer for needing to make a living but almost everything they are advertising is not needed to live an adventurous life. We don’t need any of the fancy gadgets, the latest trekking gear or brand new touring bicycles. A product does not make you more adventurous. It is your mindset that is the only thing that really matters. Living a truly adventurous life and minimalism can go hand in hand. I feel it should go hand in hand. Becoming a minimalist is as simple as asking yourself “does this add value to me?”. If not, be ruthless and remove it from your life. It is an individual choice of what will and won’t add value. Don’t let the advertising and the thoughts of others dictate what you think you need. According to this article, the average household in the UK has unsecured debts of £13,900 in 2017. I’ve been in debt and it’s not a nice place to be. It can become a consuming rabbit hole. Many people get into debt out of perceived necessity. These people are wrong. Earlier this year (at about the same time as I started this blog) I decided to make some drastic changes to my lifestyle. I had lived with consumer debt since leaving University. I could manage it and thought nothing of it. Even though I was paying up to £100 a month in bank charges, I didn’t see it as a problem as I could ‘afford’ it. I went bold and removed the one largest piece of debt that I had. I sold the shiny, not so new car I had on finance and paid off the loan. I felt like a weight had literally been taken from my shoulders. The next step was to clear my credit cards. This would take longer than clearing the car loan but I made a plan and cut back my expenses. The one thing we can all change quickly is the amount we spend each month. By reducing my outgoings I had more money to clear the debt. Does this item add value to me? Have I used this item in the last three months and will I use it in the next three months? If the answer to these questions were no it went into the sell, donate or bin pile. In total, I made about £2,000 from selling the excess possessions I had accumulated. Out went the PlayStation 4 with a load of games, the pile of blue-rays and DVD’s, my second bike and lots of other random possessions I had acquired over the 10 years since I moved out of my parent’s house. Not only did I feel liberated by selling the excess, I was making money. For every penny that goes towards credit card, overdraft or loan fees – that is money that should be yours and could be going towards an adventure or something even more sensible such as retirement. Sure, there are times when getting into debt can be a good thing such as having a student loan and a usually a mortgage. Any other debt is unnecessary. The UK and the majority of the western society has become a obsessed with instant gratification. Our relationship with consumer debt has become unhealthy and is leading to increased unhappiness. Historically, humans became happier as they got older. This is no longer the case according to this American study. If you are reading this and are currently not in consumer debt, well done. Please keep it that way. You won’t regret it. If you are in debt, make this your number one priority over the next months/years, until you have cleared the debt. For people that are financially lost, do not despair. 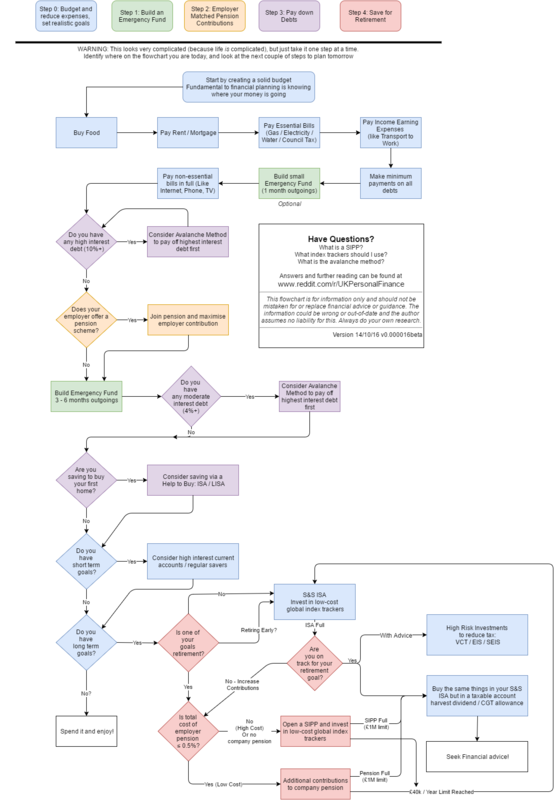 If you do one thing today, check out this flowchart. For UK readers, this will fit with most circumstances and is a great starting point. Minimalism has changed how I live my life. I no longer spend money frivolously but that doesn’t mean I don’t enjoy myself. Quite the opposite. I am much clearer about what actually makes me happy. Being outside, trekking, cycling, wild camping, swimming in the sea, playing the guitar and writing on this blog. All of these activities are actually what makes me happy. It wasn’t my PlayStation or having lots of gadgets. My enjoyment comes from experiences. Spending time with family and friends. Visiting new places and feeling like I am adding value to other people. Getting out of debt and adopting a more minimalist lifestyle is the best thing I have done this year. You don’t need to have lots of money for adventures. Last year I cycled and busked across the North of England and Northern Ireland without a penny. There are so many other free activities you can do that can bring you enjoyment. Hiking is one of the best free hobbies I have and brings me plenty of enjoyment. Rather than planning for epic and expensive adventures; small, cheap but equally fulfilling adventures are becoming my preferred method. http://www.moneysavingexpert.com/ – known for his TV programmes. Martin Lewis is still probably the number one person to give personal finance advice. This is a great place to start with financial advice. https://www.reddit.com/r/UKPersonalFinance -I’ve spent many hours browsing this forum for tips and help. Most of the advice is good but remember that anyone can post. http://www.mrmoneymustache.com/ – more of a cult of people that are planning to retire early. Some of the advice can seem drastic at first. It depends on what your financial goals are. http://www.theminimalists.com/ – the home of minimalism on the web. They also produce films, books and have a podcast. If you found this post useful and would like to receive future adventure updates, please subscribe below.